Launch date: Friday, October 28th 10:00 AM PDT. After announcing their private beta earlier this year at The Next Web Conference the platform is now open to the public allowing anyone to download their iPad application from the App Store. The name *openmargin points to the blank space surrounding a text. A space that's traditionally used by readers to write down their personal thoughts. As of today, this margin is open for all the readers of the same book. A note that's published inside the openmargin is left for other readers to find. *openmargin wants to capture the full spectrum of thought within the book itself, by asking readers to contribute their personal notes. 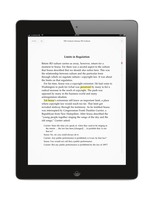 The *openmargin platform consists of an elegant e-reader for the iPad where users can import their existing books. Currently, only DRM-free ePub files are supported which can be added to the app by syncing with iTunes or via the Dropbox integration making it extremely easy to wirelessly add new books. Once a book is imported *openmargin will automatically connect the user to other readers of the same book. 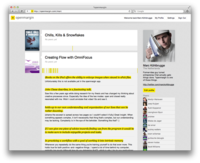 Every note that is made inside *openmargin is pushed to the user's online profile as well (example) making the webplatform a place to explore the people behind the notes through profiles visualizing the reader's journey throughout the book. Unlike traditional social networks *openmargin doesn't have an option to explicitly follow users, but instead generates an implicit network based on a reader's activity. Users will discover like-minded readers and new books based on personal interests and behavior rather than existing relationships. 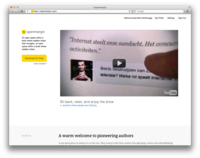 *openmargin believes a new generation of authors is on the rise. They connect with their readers through blogs, social networks and self-publishing platforms. *openmargin wants to give authors the tools to connect with their community, right inside the book. *openmargin was founded by Ruth Koppenol (creative producer), Marc Köhlbrugge (co-founder of PressDoc), Joep Kuijper (innovator at new shoes today) and supported by Martijn Walraven (software developer). The Dutch startup is currently growing, adding Fabian Markaban (software developer) and Carlo Markaban (business strategist) to the mix. To celebrate the launch of their platform *openmargin is bundling three free books with their application; Remix, Creation Today and Networking Awesomely. 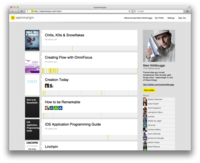 The openmargin.com platform and the iPad application are available today.